generallySpeaking: Kanheen door jab din dhal jaaye..
Kanheen door jab din dhal jaaye..
Rajesh Khanna's idiosyncratic charisma had ceased to excite in the mid-70's. 18th July served to remind us of the Beatles-like madness never seen before or after - that had swept thru urban India, not least, among the teens / youth of the softer gender. Strangely enough though, Khanna was rarely associated with the other dominating theme of that time - the hippie life-style - maybe due to the scriptwriters lack of empathy for such stories. Rajesh Khanna belonged to an ecosystem of several cinematic personalities - the much talented RD Burman, the maverick genius - Kishore Kumar, Hrishda & Shakti Samanta, Sharmila Tagore, Mumtaz. - all of who seemed to have shared creative symbiotic and artistic relationships that resulted in memorable tales & music around the values that appealed to the middle class of that time - selflessness, sacrifice, simplicity - in the backdrop of the then socialistic, left-of-center political milieu. What made Khanna's magic fade away so quickly? Maybe, directors/producers got tired of Khanna's indiscipline. Maybe, viewers got tired of seeing the themes that Khanna portrayed repeatedly. Maybe, it was the Emergency or the rise in profile of the smuggling mafia, maybe the loud 'garibi hatao' campaign of the time. all of which made being rich or even, aspiring for upward mobility - almost a guilty proposition. Or maybe, it was just coincidence that Amitabh Bachchan's 5 best movies - Zanjeer, Deewar, Sholay, Amar Akbar Anthony and Muqqadar Ka Sikandar - just left no room for any other talent to be Numero Uno. 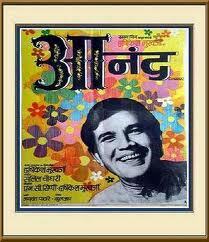 Rajesh Khanna was a born and a natural superstar, a born Anand. And quite ironically, it is Bachchan who captures the essence that is Rajesh Khanna in the now immortal line Anand Mara Naheen, Anand Marte Naheen !